Embroidered Appliqué is the technique of layering large pieces of laser cut fabric onto a garment and then using stitching along the edges to hold it in place! CUSTOM APPLIQUÉ MADE TO ORDER! Appliqué is the perfect alternative to larger, more costly embroidery projects for team names, greek letters, numbers, logos, mascots and designs. 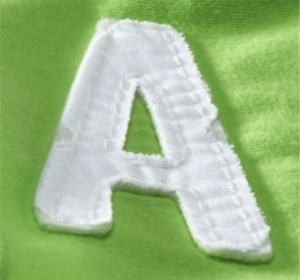 Large fabric pieces are used to fill in the solid areas of a design or letter. 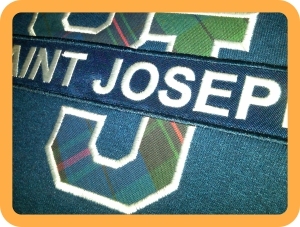 Appliqué is ideal for schools, teams and businesses who want an upscale look at an affordable price! We offer tackle twill, chino twill for distressed effects, felt, fleece, flannel, plaids and calico cotton prints. Appliqué is durable, long lasting and extremely popular. 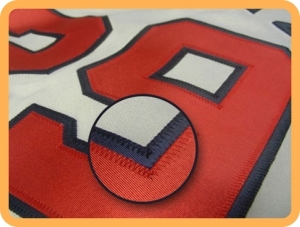 ALL Professional sports team jerseys are made using tackle twill material. The number one choice of Appliqué Fabric for Athletic Uniforms worldwide is Tackle Twill. Tackle Twill is a 100% polyester fabric woven into a very strong, very durable twill pattern. The polyester twill has a high gloss coating applied to the surface which adds satin sheen to it. ALL major sports team uniforms are made using tackle twill. The popularity of tackle twill is so huge that it is also the number one fabric used for applique embroidery designs in the market today! Chino Twill is a 100% Cotton fabric and is the #1 choice for Distressed Appliqué style designs. 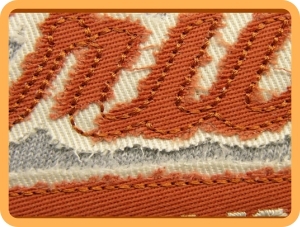 Distressed Appliqué is a unique cutting pattern performed by a special fabric laser which causes the material to "Purposely" fray and fall apart. Chino Twill does not have any coatings or finishes applied to the surface, so the fabric has just a plain cotton look and feel to it. What is unique about chino twill is its uncanny ability to curl and fray at the edges. Basically, the more you wash and wear it, the more it will distress. You've seen it, but did not know how it was done. Distressed Chino Appliqué is created using Lasers to specially cut fabrics, so that the edges purposefully fray. Distressed Appliqué offer a look more vintage, imperfect, worn, faded and washed out. 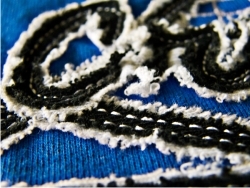 We offer two types of fabrics to produce Distressed Appliqué. 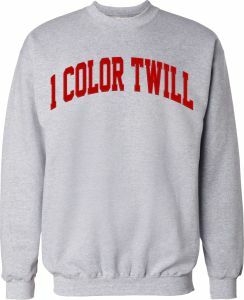 100% Cotton Twill and Acrylic Felt in a variety of colors. Just like Aéropostale & Hollister! Yes, we offer "PLUSH" Distressed Chino Appliqué! A popular technique commonly seen in retail stores. Extra soft and thick which distresses the more you wash it. Distressed Chino Appliqué can be created for most types of lettering or shapes, however, the minimum size for any of these is at least 1 inch high and 1/2 inch wide. Objects or letters which are too thin or too small should be created using solid embroidery. If you have any questions, e-mail your design concept or give us a call. Long before there was polyester twill fabric, felt was the choice for Appliqué designs. Acrylic felt is soft and fuzzy and provides that Vintage Old-Fashioned look and feel for Appliqué! 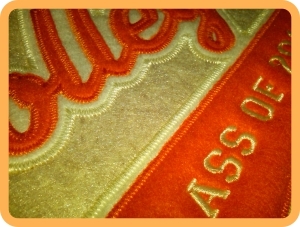 Using felt in an Appliqué provides a traditional soft raised texture to the design, similar to old style letterman sweaters. Yes, you can combine felt with other fabrics in a layered effect to achieve interesting contrasts and classic visual appearances. 100% Cotton Calico prints are the fabric of choice when designer patterns and prints are needed to Appliqué. Go into any JoAnn Fabric or HobbyLobby store and you will find hundreds and hundreds of Calico Cotton prints. Calico Cotton is extremely affordable and offers a myriad of design choices including: Polka dots, stripes, pattern prints, cartoon designs, collegiate and professional sports designs, animal skin prints and so much more, the list is endless. We offer so many kinds of fabrics for applique its almost overwhelming, but its all about choices!! You can incorporate almost any kind of soft fabric including plaids, flannel, fleece or any kind of fabric. Basically, if we can cut it with our laser and sew it, then we can use it for Appliqué work. The only fabrics which should be avoided for Appliqué work are materials containing resins, chemicals or plastics which give off harmful or toxic gases when being cut or burned by our laser equipment. We can incorporate custom made hoodie liners for ANY hoodie which you order from our On-Line Catalogs! The possibilities of fabric coordination are limitless. Your fabric or ours. Textures, Plaids, Polka Dots, Fashion prints, Animal Prints, Cartoons and much more... We can use the same Hoodie Liner fabric for your Appliqué Design!! Check Out this Video on How Its Done!